Please keep us informed of all account corrections such as address or contact information changes, new email addresses, etc. Submit new information in writing to the Seattle Cascades at info@seattlecascades.com. The Seattle Cascades do not have away game tickets to make available to the public - all tickets are facilitated through the home team ticket office. Contact our Seattle Cascades office at info@seattlecascades.com for additional ticketing information and details. There are accessible seats dispersed throughout areas of the stadium. Accessible seating and access are fully compliant with the Americans with Disabilities Act (ADA). Accessible seating and wheelchair locations are available on both a season and single game basis. For further information on locations and access appropriate options, please contact us at info@seattlecascades.com. Payment for Seattle Cascades season, group, single game and playoff tickets may be made online by Visa, MasterCard, American Express, JCB, Discover, and Diners Club, or in person by Visa, MasterCard, American Express, JCB, Discover, and Diners Club. cashier's check, money order, personal check or cash. Please make all checks payable to the Seattle Cascades. Bank items returned for any reason are subject to a $20 service fee. Your ticket is a revocable license, and may be withdrawn anytime at the sole discretion of the Seattle Cascades. All tickets are subject to the rules, regulations and policies of the Seattle Cascades and the American Ultimate Disc League. Your tickets may be revoked for reasons including, but not limited to the following: failure to meet payment deadlines, misrepresentation of tickets and violating the Game Day Code of Conduct including drunk or disorderly conduct, harassment of other guests and obscene behavior. [As stated on ticket back] "This ticket only grants entry into the Seattle Cascades home game stadium on game day and a spectator seat for the specified AUDL game, activity or other event ("Events"). Admission may be refused or ticket holder ejected at the sole discretion of the Seattle Cascades, subject to refund, or without refund if the ticket holder is deemed to be disorderly, or fails to comply with these terms, the Game Day Code of Conduct or any and all security measures. Ticket holder assumes all risks incident to the Events, including the risk of lost, stolen or damaged property or personal injury. The ticket holder grants to the AUDL, the Seattle Cascades, and their designees the irrevocable permission to use his or her voice or likeness in any media now or hereafter existing in connection with all or any part of the Events, for any purpose whatsoever, including the commercial purposes of the AUDL, the Seattle Cascades, and their sponsors, licensees, promoters, advertisers or broadcasters. All sales are final. Lost, stolen or counterfeit tickets may not be honored. 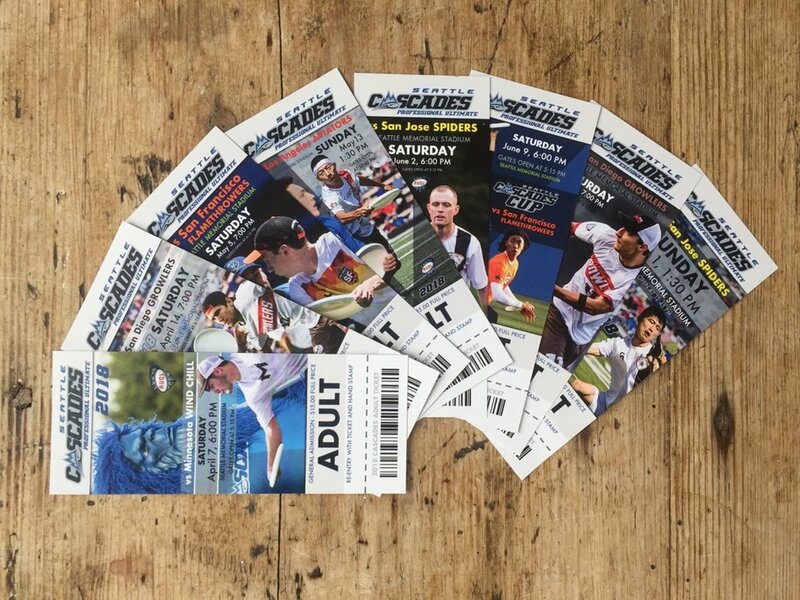 The ticket holder may not enter the Events or otherwise use this ticket for advertising, promotion or other commercial purposes (including contests, sweepstakes and giveaways) without the AUDL’s or the Seattle Cascades’ express written consent. THE DATE AND TIME OF THE GAME IS SUBJECT TO CHANGE BY THE SEATTLE CASCADES IN ACCORDANCE WITH ITS SCHEDULING POLICIES OR AS A RESULT OF OTHER ACTIONS OR EVENTS BEYOND THE ORGANIZATION’S CONTROL. NO REFUND WILL BE PROVIDED IF TICKET HOLDER CANNOT ATTEND. You and your belongings may be searched upon entry into stadium, and prohibited items may be confiscated. By tendering this ticket and entering the stadium, you consent to such searches and waive any related claims that you might have against the AUDL, Seattle Cascades, and their agents and affiliates. If you elect not to consent to these searches, you may be denied entry into the stadium." 2019 Season Tickets include seven (7) or more 2018 Seattle Cascades Regular Season home game tickets. The dates, times, and venues of these tickets will be determined in February, when the 2019 Seattle Cascades regular season schedule is announced. - Three (3) Buddy tickets for Cascades home games. - Three (3) Buddy Tickets for a Cascades home game. - Three (3) Youth Buddy tickets for Cascades home games. - Six (6) Youth ticket vouchers for Cascades home games. 2019 season ticket holders will receive a set of tickets to every regular season home game! Ticket Transfer Policy. 2019 Season Tickets are transferable. Buddy Tickets and Ticket Vouchers may be used at any home game. Each Buddy Ticket is a voucher that can be redeemed for one 2018 home game ticket. 20% Discount. Your discount can be utilized by showing your ticket ID card at the Cascades merchandise tent at any of our home games. You may offer the discount for a friend or family member to use if you are physically present at the time of the transaction. Delivery. Upon purchase of the 2019 Season Tickets, we will store your mailing address. We will then mail you the contents of your order, or in the case when you make your purchase immediately before a home game, we'll make your items available for pick up at the WILL CALL table outside the main entrance. If on the other hand you'd like to schedule a pickup during business hours at our offices in Belltown, email info@seattlecascades.com.